I ran into a case today where one of our unit tests was failing when we ran it, but would pass when we debugged it. We’re using MSTest and had recently branched the project in TFS, and I was working on changes in the new branch. We were getting a “method not found” error when running the test which immediately made me think that Visual Studio was using a cached version of the class under test. However, if you like to keep your solutions separate from the projects like we are (we have a separate folder containing all our solutions), it will use an absolute path to find the dll. So after branching, your Code Coverage list could potentially look something like this. 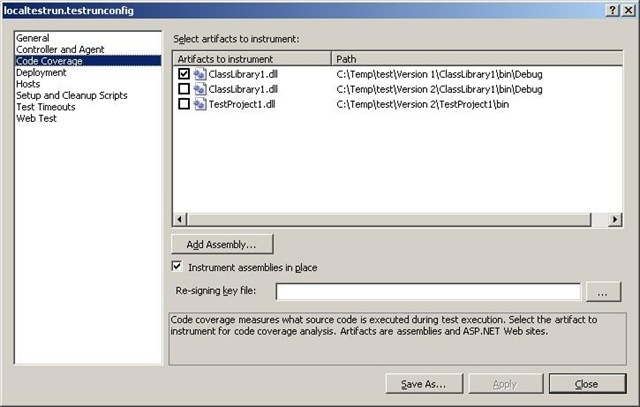 Note that there’s two ClassLibrary1.dll artifacts in the list. The first actually points to the initial branch of the code. The second points to the newly created branch. Unchecking the first and checking the second fixes the issue. On a side note, I can’t wait to drop MSTest and go back to NUnit!